When planning our honeymoon to Japan, I knew Tokyo and Kyoto were going to be stops on our trip, but wanted to find some other tucked-away area to explore. At first, when I found out about Jigokudani Monkey Park, and its hot springs in the snowy mountains of Japan that were apparently teeming with snow monkeys, I fell completely in love with the idea of having that be our third stop (with visions of jumping into a perfectly steaming natural hot tub, including sweeping views of the Yokoyu-River valley, with a handful of my best snow monkey friends). Alas, I discovered that 1. Humans are generally not allowed into the hot springs with the monkeys; 2. Even if you were permitted in the water, it probably wouldn’t be the best idea from a hygiene/ not-getting-a-parasitic-disease standpoint; and most importantly; 3. It was four hours north of Tokyo and essentially in completely the opposite direction of Kyoto. So what’s a mountain-lovin’ couple to do? Hakone, a mountainous town sitting in the shadow of Mount Fuji, serves Tokyo residents and tourists as a quick and easy escape from Tokyo’s sprawling urban jungle (only about 62 miles to the Southwest). Famous for its onsens (hot springs) and stunning views of Mount Fuji and Lake Ashi, Hakone seemed like the perfect stop-over on our way to Kyoto. And it truly was. Arguably even better than sitting with a bunch of snow monkeys in a hot spring. You’ll get there by taking the Odakyu Line from Shinjuku Station to Hakone-Yumoto Station, with either the express train, requiring a transfer at Odawara (taking about 2 hours and costs about ¥1200 ($12)) or the goofily-named Romance Car, a limited express train (which shaves off the transfer and about 40 minutes of your ride to Hakone, but requires an extra ticket in addition to the express one, which costs an extra ¥800). If you take the Romance Car, note that you will have to reserve your seats in advance, either with a ticket agent or with a machine. Justin and I didn’t realize this and so were sadly seated apart for the first ten minutes of our trip. The sweet elderly man next to Justin graciously swapped seats with me, but let’s avoid inconveniencing others if we can, shall we? From Hakone-Yumoto Station, you can get around Hakone with its famed eight modes of transportation, ranging from a touristy pirate ship that cuts across Lake Ashi to a ropeway dangling over an active volcano to a cable-car that glides up Mount Hakone. It’s worth noting that Hakone seems VERY popular with local and international tourists. Justin and I went on a Sunday afternoon and somehow, all of the trains getting there were seemingly completely sold out. Once in the town, the attractions didn’t seem overly crowded, but if you have any agoraphobic tendencies, you may feel vaguely uncomfortable on your journey there. Hakone had so many do’s that it seems wrong to start with what to avoid. But it was such a huge mistake on our part that I want to save you the trouble. Not terrible views from the train on the way to Hakone. 2. Thinking the train conductor is trying to swindle you into buying tickets to some dumb pirate ship, when really he is recommending that you purchase the Hakone Free Pass, which will save you around a hundred bucks in the long run. The Hakone Free Pass, misleadingly costing about $50, includes your roundtrip ticket to Hakone, unlimited travel on all eight types of public transit once you’re in the town, and discounts on admission to over fifty attractions, for the two consecutive days following your use of your pass. Hakone, as a somewhat remote, mountainous town, is pretty spread out, leaving you depending on public transit nearly everywhere. While not unreasonably priced, all of those cable cars and train rides and ropeways can add up quick. Because we turned the astute conductor’s recommendation down, we probably spent over ninety or so bucks that we would have saved had we just went along with the conductor’s pirate pantomiming. 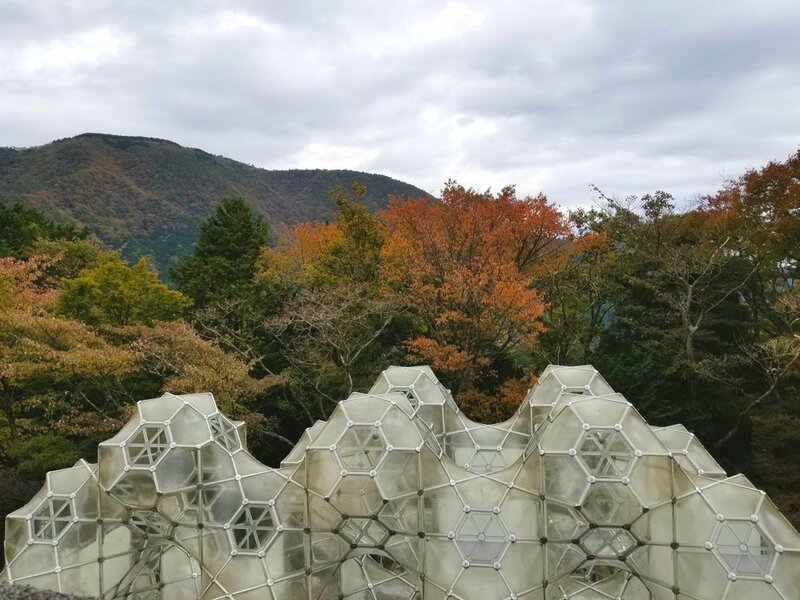 This sculpture park, set against the unbelievably gorgeous backdrop of Hakone’s rolling mountains, is EVERYTHING. From its diverse range of sculptures, artfully integrated into the landscape (a work of art in its own accord), to its world-class collection of Picasso pieces, to the hot springs offered halfway through your museum tour specifically designed FOR YOUR FEET, this is inarguably my favorite art museum I’ve ever been to. 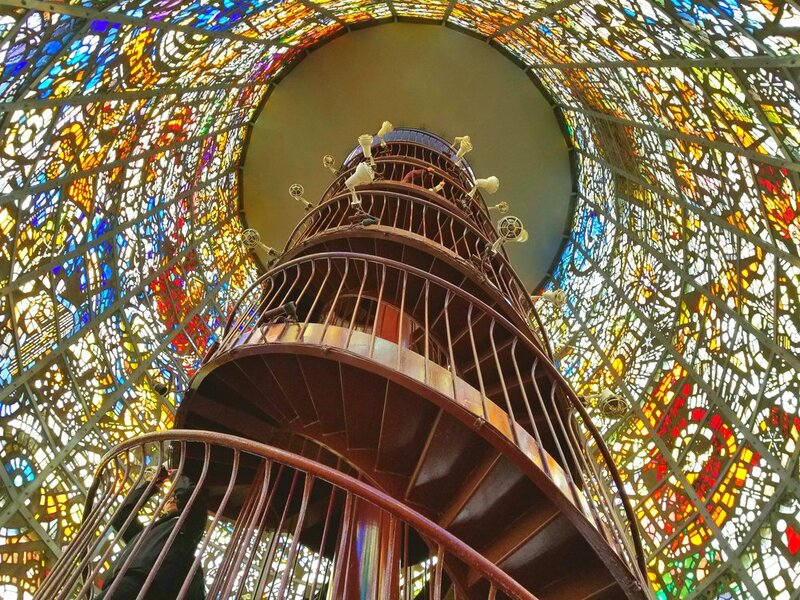 In my opinion, this museum is a must-see while you’re in Japan (so I guess you’re going to have to stop in Hakone!). Well worth the ¥1600 entrance fee (only ¥1400 with the Hakone Free Pass!). Bonus tip- when we visited, we had our huge backpacks that aren’t allowed in the park. The Museum provides free lockers outside of the ticketing booth, that may be handy if you need to drop off your bag as you see the Museum, hit up lunch, or hike around the area. There's also paid lockers at the Gora train station, but an exceedingly limited amount (and how can you beat free, amirite?). Soak it all in at a onsen. Fed by over a dozen hot springs, Hakone is literally covered with bath houses and ryokan (traditional Japanese inns), featuring private and public onsens. For our November honeymoon, there was nothing better after a long day of trudging around the cool misty mountains than ending the night with a dip in an onsen, sipping a glass of locally brewed saké. Enjoying the hot springs for your dogs at the Hakone Open Air Museum. These private onsens are also godsends to my tattooed brethren out there- there are some really cool onsens in Tokyo (I dreamed of visiting Oedo Onsen Monogatari), however, most public ones do not permit tattooed people to enter. Tattoos are strongly and almost exclusively associated with the yakuza (the Japanese mafia) in Japan and thus, you and your sleeves will have to enjoy your onsen elsewhere. However, most private onsens don’t care whether you’re tattooed, as well, you’re not around anyone else while you’re naked! For the ryokan we stayed at (Hakone Gora Kanon), their Frequently Asked Questions indicated that being tattooed in their private onsens was fine, but, if you’re going to use their public onsen, “we would be very happy if you just take note of that, most Japanese people (especially children) are not really used to see[ing] tattoos. Children will be happier if you smile at them friendly, so that they can see that tattoo[s are] not something to be afraid of.” So always remember to smile friendly and try not to scare small children. The Hakone Ropeway takes you, in the comfort of a gondola, from the base of Lake Ashi (departing every minute from Togendai Station, with ten passengers per car) to its terminating spot, a good portion of the way up the mountain (Sounzan Station, where the cable car begins). This affords you the opportunity to get a breathtaking bird’s eye of view of Lake Ashi, and if the weather cooperates, Mount Fuji (unfortunately, the clouds impeded our view on the day we went; word on the street is that you need to go before 11 am for the best chance of spotting the elusive mountain). You are required to transfer at the Owakudani Station, the halfway-point of the ropeway, as the upper portion is often closed due to unsafe levels of volcanic gases. That’s right; the ropeway takes you over an active volcano, the source of Hakone’s many hot springs. Up close and personal, the volcano is stunningly beautiful and boy oh boy, do you get well-acquainted with the infamous sulphury/rotten-eggs stank. As touristy as this might seem, it’s totally touristy for a very good reason. That being said, this is a POPULAR attraction- while we didn’t wait more than 20 minutes or so to get on our gondola, departing from Lake Ashi, the lines we passed at Owakudani for the rides going down the mountain were extraordinarily long. Like hours and hours of waiting. Thus, I’d maybe recommend hitting this first thing in the morning and departing from Togendai Station, to avoid Disneyland-like crowds and maximizing your chance of seeing Fuji. Watch the sunrise over Mt. Kamiyama. One of my favorite memories of the whole trip involved waking up at 5 am (which usually would sound fairly horrific to me) to watch the sunrise from our ryokan’s balcony. Being there in November,the fall colors were in full blaze, and it was almost ethereal to watch the sunlight spill over the mountain top and illuminate our valley, with sweet songbirds chirping in the background. Had we went in warmer months, I would have tried to do the hike up Mount Fuji to see the sunrise from its peak, but alas, allegedly you will “die” if you do this November (the official climbing season is early July to mid-September). Either way, I don’t think I would trade my memory of sipping green tea on a balcony with my new husband, tightly wrapped in our yukata (Japanese robes), watching the sun create gorgeous colors across the clear Hakone sky, for anything. After finding a plethora of tasty vegan options in Tokyo, I wasn't sure what to expect from a food perspective in Hakone. Ultimately, while you may have to look a little harder, there was plenty of delicious food to keep us satisfied for our time in this beautiful town. Another one of my favorite stops on the trip was at Amazake-chaya Tea House, the last traditional tea house on Tokaido road, the road that historically served as the main artery between the shogun capital of Edo (Tokyo) to Kyoto, the country’s imperial and spiritual center. Having been in continuous operation for over 360 years, this tea house has served everyone from Japanese royalty to samurai. Arriving first thing on a chilly November morning, we stepped into the thatched-roof, packed dirt floor structure, with low tables hewn from tree trunks scattered about (for any true history diehards out there, note that this structure is not original, as the actual wooden tea house has burned down numerous times over the centuries; that being said, the relative newness of the tea house was imperceptible, given the extraordinary attention to detail paid to replicating what the structure looked like 300-plus years ago). An older man (part of the 13th generation of this family to run the tea house) shuffled out of the kitchen, lighting the irori (traditional fireplace) for us and serving us grilled mochi (glutinous rice cakes), ginger tea, and amazake (a sweet non alcoholic drink made from fermented rice; get it with ginger!). These traditional goodies have long been on the tea house's menu, offered for their nutritious sustenance to travelers on the long trek across Japan. Trust me when I say there’s nothing better for a cold Autumn morning than a warm belly full of traditional Japanese baked sweets and a cozy seat by the irori. In warmer months, you can enjoy your amazake under the canopy of trees surrounding the tea house. Note- Getting here was a bit of an ordeal for us. While we could’ve gotten here by public transit from our ryokan, it would’ve taken at least two types of transportation, and would have set us back a couple of hours, as one of the buses we needed didn’t start running until around 8:30. Thus, we wound up taking a taxi here, but it wound up costing almost ¥4000 ($40). If you’re going to be in Hakone for longer than a day, I might recommend renting a car to help cut down on time spent getting from one spot to another. Conveniently located halfway between the Chukoku-no-mori station on the Hakone Tozan line (Hakone’s switchback train) and the Open Air Museum, Hakone Kappei is a small sushi restaurant that clearly cares about serving vegan customers. They offer several vegan options, including cucumber, dried gourd, and Japanese pickled radish rolls; edamame; cucumber with garlic miso; and inari, which are clearly marked on the menu that offers English translation. We ordered pretty much all of the vegan options, as well as some hot sake to wash it all down. Super cheap; lots of yummy options; and filling! We were planning on going to dinner at Shika-Jaya, a restaurant specializing in tofu, that is supposed to prepare amazing vegan dinner sets. However, after accidentally taking an overly long nap, we would have reached the restaurant far after closing (and would have required another almost $40 cab ride… both ways from our ryokan). We instead moseyed down the mountain to the Gora station, the heart of the portion of Hakone we were staying in, and decided to check out our (...exceedingly limited) options. We stopped in at Gyoza Center, a place that we had passed earlier in the day that had a line literally out the door and spilling into their alleyway. This restaurant, filled with country charm, dried flowers, and old knick knacks, definitely does not cater to vegans- their whole menu focuses on shrimp and pork stuffed gyoza. However, our server, a stoic elderly man, patiently helped us figure out (with a great assist from Google Translate) what we could modify and eat from the menu. We had edamame; fried seaweed-wrapped sweet potato; and several tofu based dishes. Their tofu was so creamy and delicate, and the fried sweet potato, seemingly the first crunchy thing I had eaten in Japan, was a savory delight and texterual departure from the many soup and rice based dishes that predominated most of our trip. Moderately priced; kind wait staff; and delicious food made this last resort stop a pleasure. After one day in Hakone, I wish we had spent at least another there, but alas, Kyoto was awaiting us- so we were off to our next adventure! Have you ever been to an onsen in Japan or taken a day trip outside Tokyo? Japan is such a gorgeous natural setting, and I’m so curious to know what areas others have explored; let me know in the comments below!